In 2013 designer and illustrator Michelle Mason co-founded Mason & Painter, a vintage emporium in east London on a street famed for its Sunday flower market. Many of the vintage items sold in the shop are lovingly restored to sell as containers for flowers and plants. Michelle's inspiration for this book is the wide variety of seasonal plants and flowers available right outside her shop. 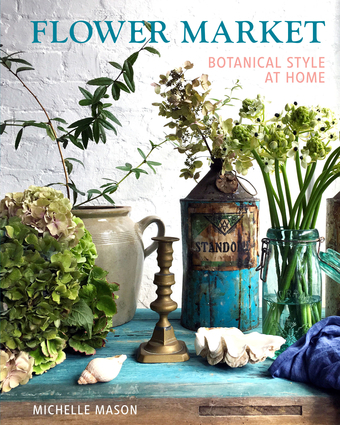 Using salvage and reclaimed objects as props and backdrops, Flower Market: Botanical Style at Home is brimming with texture, color, pattern and exciting and inspiring ways to group and display flowers, plants and succulents. Michelle draws on her design experience, playing with shapes, colors and textures to create combinations that work well together, blending layers of hue and pattern, to show how to make the most of fresh flower purchases and bring botanical style into the home. Designer, illustrator and co-owner of successful vintage emporium Mason & Painter, Michelle Mason has done design work for clients including British Library, Transport For London and St. Pancras International. Endorsed as "the stylist's favourite" by The Sunday Times Style magazine, she has appeared in articles for Guardian Weekend, Sainsbury's Magazine, and Living Etc, and has contributed articles to Design Exchange magazine and travel articles for Trail Blazer magazine.